I love my dog treats! Boy, do I love to eat dog treats and dog snacks. But Mom over there tries to make sure I only eat the healthiest and safest dog treats around. She, of course, makes me my own homemade dog treat recipes, which I think are the tops! The tops, I tell you. But sometimes she likes to have a stash of healthy dog treats that are always ready to go and put in her pocket. So today, I’m going to talk to you about Wagatha’s Organic Dog Treats. Mom first purchased these organic dog treats for my girlfriend, Sabrina Furchild. Yes, that’s right, I have a girlfriend. Mom thought they looked healthy and tasty, and they had a variety of good flavors to choose from. I’m not sure what took her so long, but she finally bought me my own box of Wagatha’s Organic Dog Treats. I can tell you I think these organic dog treats are the tops! Okay, maybe not as good as Mom’s home-cooked treats, but they are super tasty, and crunchy but not hard. I’ve been trying a variety of their flavors and so far I gobble each one up. Some nice details about Wagatha’s Organic Dog Treats: All ingredients in their organic dog biscuits are sourced from organic growing areas within North America, with the exception of the extra virgin olive oil (Spain or Italy), and bananas (Central America). That’s right, NO CHINA! Yippee! The organic dog treats are made in small batches in a human grade bakery in Vermont. 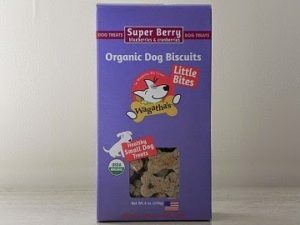 Wagatha’s Super Berry Biscuits Ingredients: USDA CERTIFIED ORGANIC INGREDIENTS: whole barley flour, cranberries, blueberries, applesauce, ground flax seed, canola oil, sunflower seeds, carrots, cinnamon, ginger. Wagatha’s Organic Dog Treats are a hit with me! Does your dog enjoy a crunchy, organic dog treat? Tell me in the comments.